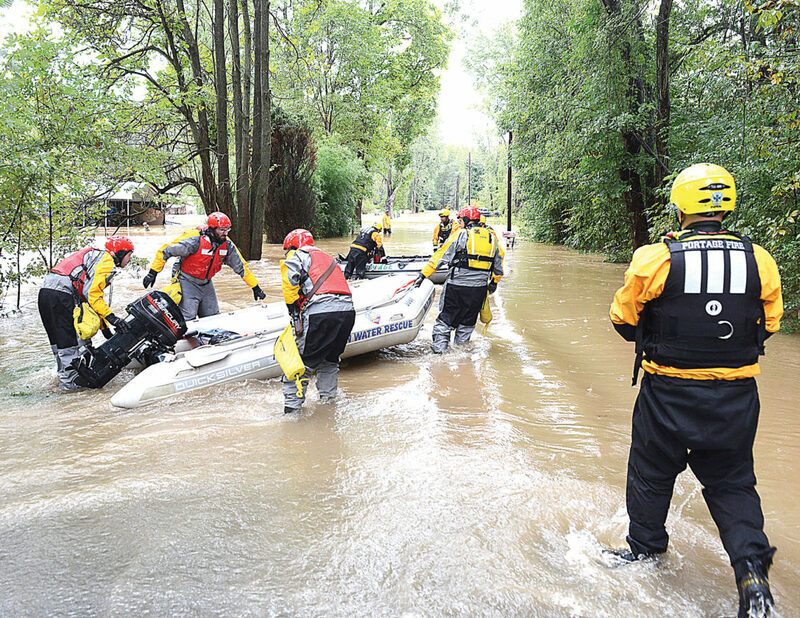 Mirror photo by Gary M. Baranec Members of Geeseytown, Saxton and Portage volunteer fire companies performed a number of water rescues in the Linds Crossing area of Frankstown Township on Monday as residents sought to get out of the floodwaters. Firefighters with large military-style brush trucks assisted in 10 or more voluntary home evacuations in Blair County on Monday afternoon, especially in Frankstown Township, Blair County Emergency Management Director Mark Taylor said. 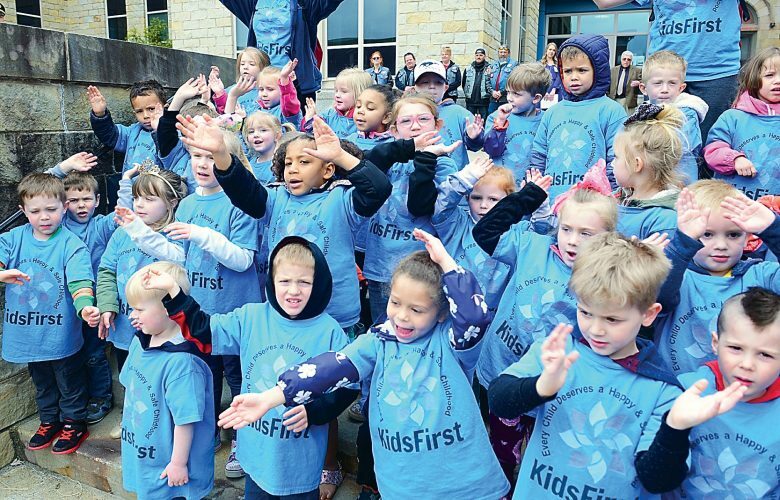 Some schools dismissed early as superintendents feared rising water levels throughout the afternoon would prevent safe passage home for students. The scene was the same in Bedford County, as relentless rain from remnants of Tropical Storm Gordon and a frontal boundary soaked the region. Dave Dombek, senior meteorologist for AccuWeather, also said today will be clearer. 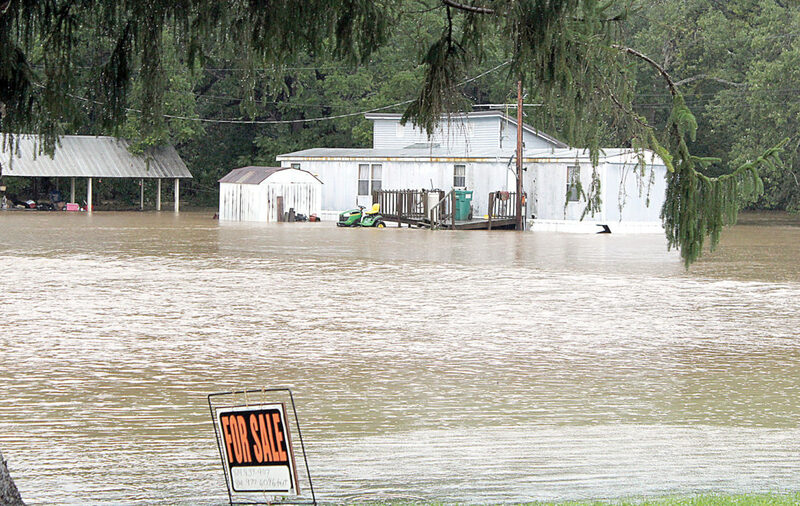 Mirror photo by Holly Claycomb Bobs Creek overflowed its banks Sunday afternoon, closing local roads and inundating homes located along its banks in the Reynoldsdale area. This home along Reynoldsdale Road was surrounded by the rising waters of the creek, which is usually located a few hundred yards behind the home. 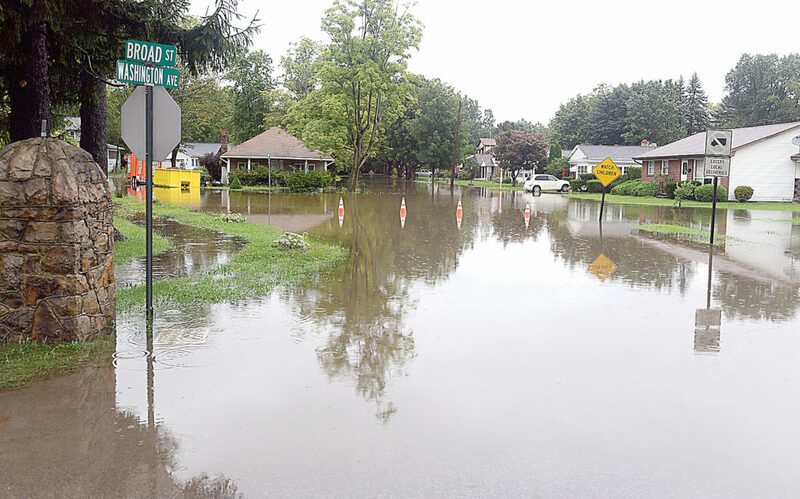 David Cubbison, Bedford County Director of Emergency Services, said EMS staff and volunteers have been responding to numerous calls to pump flooded basements, help evacuate people from their homes and perform rescues of motorists trapped in vehicles. Some people ignored warning signs and drove on flooded roadways, causing their vehicles to float off the road or to stall, he said. Cubbison said that EMS staff and volunteers responded to all rescue calls, but added that people who ignore warning signs are putting the lives of themselves and rescuers at risk. He said the Saxton region along state Route 26, the Raystown area and Camp Pleasant in Alum Bank experienced a lot of flooding. Waterways from Everett heading to Saxton were experiencing rising water levels, as well, he added. Mirror photo by Gary M. Baranec Large sections of Duncansville experienced flooding Monday, with many homeowners using pumps to clear water from basements. “The ground is still pretty saturated,” Cubbison said, commenting on how the ground is typically dry around this time of the year. Area school districts dismissed students early Monday as rain was brought by a rapidly intensifying tropical storm. Bellwood-Antis Superintendent Tom McInroy said he is unsure how the next few days will unfold once Hurricane Florence moves onto land, dumping more rain on the East Coast. The National Hurricane Center is forecasting Florence to be a major hurricane, Category 3 or 4, when it hits the coast Thursday. Florence may become only the fourth Category 4 hurricane to make landfall along the U.S. East Coast north of Georgia. Meteorologist Colbert said it’s uncertain how Florence will affect Pennsylvania. “Even by Saturday, it’s still in North Carolina — if that’s the case, then it’s good news for Pennsylvania. But it’s still an uncertain forecast. If it comes up further north Friday, Saturday or Sunday of the coming week, there would be plenty of water issues for central Pennsylvania,” Colbert said. Only Altoona Area and Spring Cove School Districts had full school days Monday in Blair County. Williamsburg Community School District announced its closure Monday morning while other districts — Claysburg, Tyrone Area, Hollidaysburg Area and Bellwood-Antis — delayed the start of school or dismissed early. Hollidaysburg Area’s Frankstown Elementary School was closed from the start, as roads in that area were closed. The Bedford Area School District was closed all day due to weather conditions. Students in the Northern Bedford County School District attended school for a couple of hours before being dismissed before 10 a.m. Between a two-hour delay and an early dismissal, Bellwood-Antis students received lunch and instruction time from 10 a.m. to noon, so it counted as a school day and will not have to be made up later in the year, McInroy said. “I’ve only ever done this once or twice before when hurricanes dump a lot of water on us. This is unusual,” McInroy said. Moving water can wash a car from a roadway, and a flooded roadbed may not be intact, PennDOT officials said. Lutzville Road from the on ramp from Route 30 West at Lutzville Road to the intersection of Ashcom Road in Snake Spring Township. Adams Run Road from the intersection of Route 56 (Quaker Valley Road) to the intersection of Reynoldsdale Road in East St. Clair Township. Pine Grove Church Road/Indian Eve Road from the intersection of Route 56 (Quaker Valley Road) to the intersection of Maple Leaf Road in East St. Clair Township. Chalybeate Road from the intersection of Belden Road to the intersection of Imlertown Road in Bedford Township. Imlertown Road from the intersection of Briar Valley Road to Younts Road in Bedford Township. Bobs Creek Road/Reynoldsdale Road/Imler Valley Road from the intersection of Hoagland Road in Bedford Township to Route 869 (Heritage Road) in King Township. Crissman Road from the intersection of Route 96 (Cortland Road) to the intersection of Crissman Road/Dunnings Creek Drive in West St. Clair Township. Route 764 from the intersection of Burgoon Road to the intersection of Logan Boulevard in the City of Altoona. Reservoir Road from the intersection of Chris Street/River Road to the intersection of Locke Mountain road in Frankstown Township. Royer Mountain Road/Locke Mountain Road from the intersection of Reservoir Road to East Loop Road in Frankstown Township. Juniata Valley Road from the intersection of Route 22 to Upper Reese Road in Frankstown Township. Knob Road/Knob Run Road/Allegheny Street/Puzzletown Road from the intersection of Poplar Run Road to the intersection of Weaver Road in Freedom Township. Fox Run Road at the intersection of Yellow Springs Drive in Catherine Township. First Street/Covedale Road from the intersection of Spring Street in Williamsburg Borough to the intersection of Clover Creek Road in Woodbury Township. Sabbath Rest Road/Lower Riggles Gap Road from the intersection of Old Sixth Avenue Road to the intersection of Antis Road in Antis Township. Turkey Valley Road/Quarry Road/Beaverdam Road/Scotch Valley Road from the intersection of Route 22 to the intersection of Turkey Valley Road in Frankstown Township. Logan Boulevard northbound from the intersection of Baker Boulevard/Burgoon Road to the intersection of Route 764 (Sixth Avenue) in the City of Altoona. Logan Boulevard southbound from the intersection of Beale Avenue to the intersection of Route 764 in the City of Altoona. Route 22 from the intersection of Reservoir Road/Frankstown Road in Frankstown Township to the intersection of Route 453 Birmingham Pike in Morris Township, Huntingdon County. Ironville Road from the intersection of Quarry Road in Snyder Township to the intersection of Route 453 (Birmingham Pike) in Snyder Township. Yellow Springs Drive from the intersection of Recreation Drive to the intersection of Route 22 in Catherine Township. Route 866 from the intersection of Black Street/First Street in Williamsburg Borough to the intersection of Route 22 (William Penn Highway) in Frankstown Township. Sugar Run Road from Tunnelhill in Cambria County to Canan Station.